It was love at first sight. And I mean it. 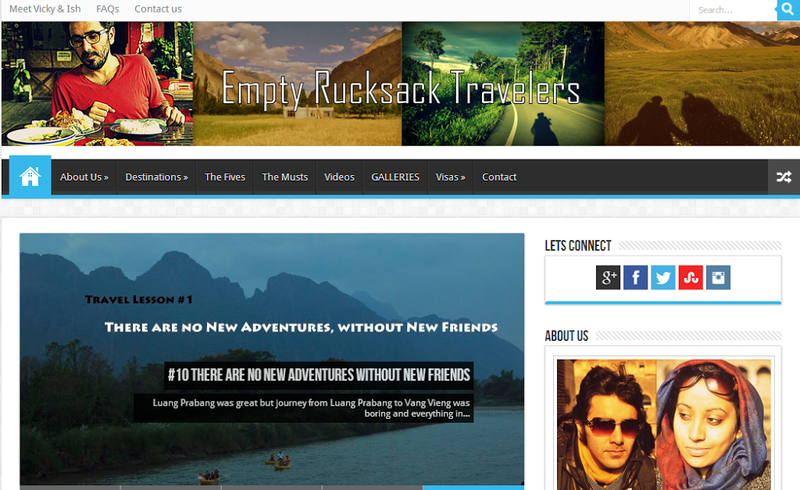 I was sifting through some blogposts on indiblogger when I found a rather interesting name, Empty Rucksack. It made me smile and I decided to read more about the story behind this creative name. The long version is we set sail on 28th November 2012 (and that is a very important day for the one among the two of us) from our rented house in London to travel the world for an year. We have been out and about for an year now and nowhere close to even halfway through. But our rucksacks which we try to keep light and are now overflowing with loads of memories, stories and pictures. And they are getting heavy. So here we have arrived creating a port of transfer to unload our experiences and share them around, to send you love and inspiration if you want to kick that desk job and give what we are doing a try. Mostly we thought it would be fun to have conversations about travel with people who are far away and love traveling just as much. And before I could even say I like these guys a lot, I was on night calls with the better half of the duo (Ishwinder!) exchanging notes on blogging, marriage traveling and what not. You can read the guest post they did for this blog here. We are also co-admins for a facebook group on travel called ‘India Travelers Club‘. And have had some fun moments together there creating discussions, photo collages and what not. And while we are at the subject of this club, I thought why not spread some blog love to the other not-so-active-in-blogging admin of the same group. Siddhartha Varshney who blogs at Pseudo Rationalist . Now I am tagging him in this post so that you all can help me get this man out of his writing slumber and kick start his almost dead blog! Connecting it with Write Tribe’s Festival of Words who are the soul reason my writer’s block is slowly fading away. This particular post for their theme ‘blog love‘. I got to know Empty Rucksack through your blog and I both envy and admire the duo for what they do! 😉 Love the blog, the no-nonsense- to-the-point traveling tips accompanied with fabulous pics! You have summed it up well! I think I’ve heard of Empty Rucksack before. I’m not a big travel writing and don’t have the opportunity to travel anymore, so rarely get to read anything on the subject. That’s for sharing though, and I will check it out if/when I get to travel anywhere again. This page is so visual! Love it. I appreciate your showing us a new outlet for travel, especially India with all of the color and magic. I worked with a Tantra teacher here and she has provided me a curiosity for both ancient and modern practices. Wow! I liked the story behind their blog name. Very creative and so cool and so apt too! Bookmarking their blog! Yes hema they are very innovative bloggers I must say! Yes some of the names do grab your attention and theirs is surely one! Empty rucksack is truly nice…I have read a couple of post and I think it is awesome. am off to read their blog! Thanks for the information on the rucksack 🙂 I guess it is anything but empty 🙂 off to read it now ! No mention of me and my post!